In developing a model of bacteria growth, we detailed every step of building the model from the data. Since we assumed the change in the population size in one time step was a linear function of the population size, the model was so simple that we could even solve it. We ended up with a fairly simple expression showing the exponential growth of the population size. Here we'll examine a situation that seems completely different. We'll look at what happens when we give a patient a bolus injection (a one-time injection) of penicillin. In this case, of course, the penicillin won't start multiplying like bacteria in the patient. Instead, the body (i.e., the kidneys) will start removing the penicillin from the body. However, if we make a model where the amount of penicillin removed is a linear function of the amount penicillin in the blood, the model is starting to look a lot like the bacteria growth model. In fact, we'll get exponential decay of the amount of penicillin in the blood. There's one more big difference between the bacteria growth example and this page. Here, we'll just get you started on the process, giving you background information about the drug clearance. We then let you go make the model on your own. When penicillin was first discovered, its usefulness was limited by the efficiency with which the kidney eliminates penicillin from the blood plasma (blood minus blood cells) passing through it. The modifications that have been made to penicillin (leading to amphicillin, moxicillin, mezlocillin, etc.) have enhanced its ability to cross membranes and reach targeted infections and reduced the rate at which the kidney clears the plasma of penicillin. Even with these improvements in penicillin, the kidneys can still remove penicillin fairly rapidly. In this project, you will build a mathematical model of penicillin clearance based on an assumption of how the kidneys operate. The secret to your success will be to build into the model a key parameter that captures the speed of the penicillin clearance. Then, you can estimate the model parameter by fitting predictions of the model to data. Lastly, you will compare your model predictions to the data to see how well the model matches the data. The assumption behind the model is that the amount of penicillin removed by the kidneys in a five minute interval is proportional to the total amount of penicillin. We can formulate this assumption as a word model for the renal (i.e., kidney) clearance of penicillin. In each five minute interval following penicillin injection, the kidneys remove a fixed fraction of the penicillin that was in the plasma at the beginning of the five minute interval. Your goal is to translate this word model into a mathematical model that has a parameter that determines how much penicillin the kidneys remove in each interval. You can then use the below data to determine this parameter. The following table and graph contain data for serum penicillin concentrations at 5 minute intervals for the 20 minutes following a bolus injection (a one-time injection) of 2 g into the serum of “five healthy young volunteers” (read “medical students”) taken from T. Bergans, Penicillins, in Antibiotics and Chemotherapy, Vol 25, H. Schøonfeld, Ed., S. Karger, Basel, New York, 1978. We are interpreting serum in this case to be plasma. 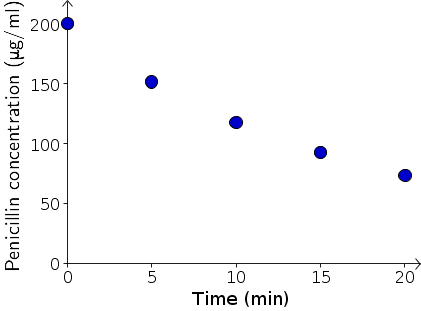 the assumption that the drop in penicillin concentration each 5 minutes will depend linearly on the concentration. If all goes well, you should be able to create a model that has an unknown parameter, fit the model to determine that parameter from the data, and then compare your model prediction to the data to see how well you did. When you are all finished, you can compare your results to some findings from the research literature. Analysis of some numbers from the research literature seems to indicate that the all of the blood plasma of a human passes through the kidneys every 5 minutes and that the kidneys remove about 20% of the penicillin in the blood that passes through them.1 You can determine if your analysis of the above data yields a result close to that rate of clearance. Instructions from writing up the penicillin project are here. For more practice on building dynamical system models, try out the exercises. That all of the plasma passes through the kidney in 5 minutes is taken from Rodney A. Rhoades and George A. Tanner, Medical Physiology, Little, Brown and Company, Boston, 1995. “In resting, healthy, young adult men, renal blood flow averages about 1.2 L/min”, page 426, and “The blood volume is normally 5-6 L in men and 4.5-5.5 L in women.”, page 210. “Hematocrit values of the blood of health adults are $47 \pm 5\%$ for men and $42 \pm 5\%$ for women”, page 210 suggests that the amount of plasma in a male is about 6 L $\times$ 0.53 = 3.18 L. Moreover, J. A. Webber and W. J. Wheeler, Antimicrobial and pharmacokinetic properties, in Chemistry and Biology of β-Lactin Antibiotics, Vol. 1, Robert B. Morin and Marvin Gorman, Eds. Academic Press, New York, 1982, page 408 report plasma renal clearances of penicillin ranging from 79 to 273 ml/min. Plasma (blood minus blood cells) is approximately 53% of the blood so plasma flow through the kidney is about 6 liters $\times$ 0.53/5 min = 0.636 l/min. Clearance of 20% of the plasma yields plasma penicillin clearance of 0.636 = 0.2 = 0.127 l/min = 127 ml/min which is between 79 and 273 ml/min. Constructing a mathematical model for penicillin clearance by James L. Cornette, Ralph A. Ackerman, and Duane Q. Nykamp is licensed under a Creative Commons Attribution-Noncommercial-ShareAlike 4.0 License. For permissions beyond the scope of this license, please contact us.